It's growing in sphag moss at present but will be repotted to bark mix after flowers die off. Kept at 74 to 76 degrees, 40 to 50 percent humidity, bright filtered light. Join in and write your own page! It's easy to do. How? 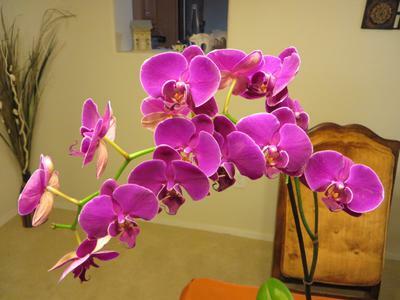 Simply click here to return to Phalaenopsis Orchid.